Get your campfire good an hot! Place chicken and vegetables into your Dutch oven. Mix the Coke and ketchsup, and pour over top. Cook for about an hour over your campfire, or until the chicken is done and the vegetables are tender. You're gonna love this recipe! Cut the top off the green pepper and clean them out. Keep the tops. Then mix together all other ingredients, form into 4 individual balls. Fill each green pepper with a hamburger ball and then put the top of the pepper back on. Put the peppers on a wire rack in the bottom of your Dutch oven. Cover. 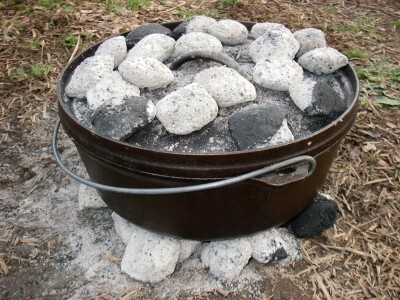 Place about a dozen hot coals under your Dutch oven and 10 or more on top of the lid. Cook about an hour and a half, adding fresh coals every 30 minutes or so. This Dutch oven recipe is easy and quick to make. In a Dutch oven, cook the beef, celery and onion over medium heat until meat is no longer pink; drain. Add the tomato juice, tomatoes, beans, soup, water, chili powder, brown sugar, bay leaves, salt and pepper. Bring to a boil. Reduce heat; cover and simmer for 30 minutes. Stir in macaroni. Cook, uncovered, 5 minutes longer or until heated through. Discard the bay leaves before serving. Easy campground cooking recipe can be made in a dutch oven, RV oven, or a crock pot.